Film-maker and friend Chris Daniels is currently doing a residency at the Newbridge Project in Newcastle. As part of this, he will be showing a selection of films by the Film Material Soup collective. My film Noah’s Ark (TBC) will be part of the programme. Once again, I’m in some fine company. ‏The Newbridge Project, 12 New Bridge St West, Newcastle upon Tyne, NE1 8AW. 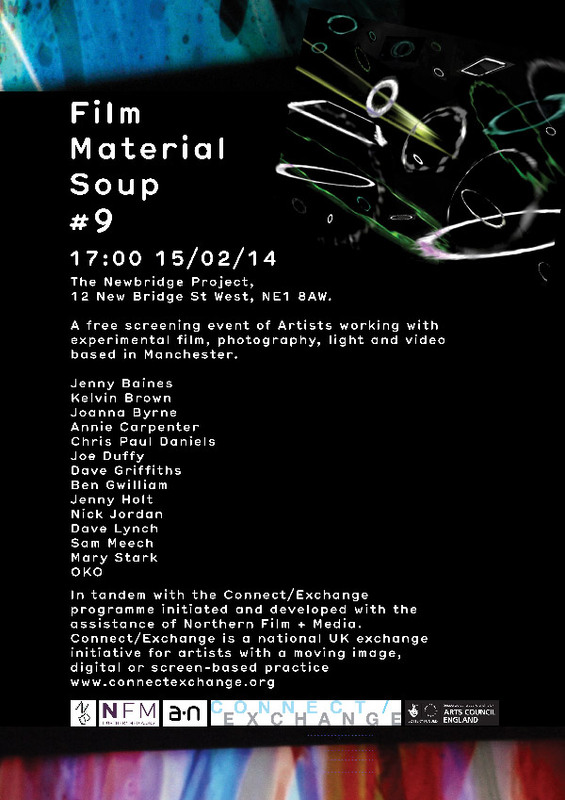 ‏Join us for a free screening of recent works by members of Film Material Soup – an informal collective of Artists working with experimental film, photography, light and video based in Manchester. Screening as part of Chris Paul Daniels’ residency at the NewBridge Project as part of the Connect/Exchange programme supported by Northern Film + Media this screening has been programmed by Daniels in relation to works that link thematically to his research into ideas of presence, location and identity.